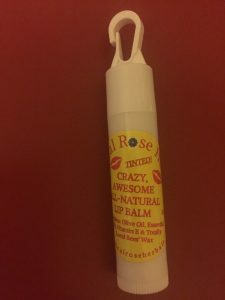 ALL NATURAL LIP BALM Moisturizes lips. Feels smooth and natural on your lips, not like the paste you find in some lip tubes. Our lip balms come with a clever hook on the top which can clip to your pocketbook, backpack, keyring, etc.! Contains only Olive Oil, Beeswax and Essential Oils with Ginger for lip plumping and Peppermint for a “sparkle” on your lips. Magically tastes naturally sweet, with no added sweeteners! CHOOSE PLAIN OR TINTED. 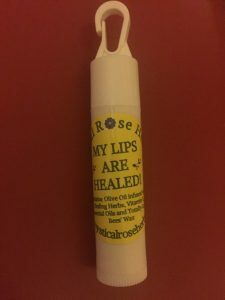 “MY LIPS ARE HEALED!” Lip Healing Therapy. Heals chapped lips overnight. Contains: Olive Oil, Comfrey Lf. & Beeswax. “HERPES HATER” Cold Sore Killer. Contains Olive Oil infused with Melissa offl, and Beeswax.